Taking a selfie has become a popular phenomenon all over the world, whether it is taking a picture of yourself, with your friends or family. But frankly, using just your extended arm to take a picture of yourself is quite difficult – your face looks too close up, your arm inevitably photo bombs the picture and unfortunately only your face is dominantly seen in the pictures. Thanks to Smart Products, we received the Compact Monopod Selfie Stick that aids you in taking some amazing and beautiful pictures of yourself. The Compact Monopod Selfie Stick has been created just for this purpose and takes this device to the next level. While most selfie sticks are long and cumbersome to carry, this one offered by Smart Products is compact and can be folded to a length of only 20 centimeters, making it easy to use and carry around. Weighing 150 grams, it features Bluetooth connectivity to the smartphone and supports both Android and iOS operating systems. The Bluetooth function can be used up to a range of 20 meters. This selfie stick has been made using stainless steel and when completely opened, it extends till 80 centimeters and can support weights of up to 500 grams. The smartphone that is attached to the selfie stick is fixed properly in its spot without the fear of falling out, as it is sturdy and strong. Pictures can be taken using the button on top of the handle, which is easy to use and operate. Since the monopod can also be folded down to a smaller size, it wouldn’t require too much space to carry and even provides various options for taking pictures. It also features a groove that doesn’t allow the smartphone to be rotated of the left or right, and keeps it pointing in one direction, for easier picture taking. This also eliminates the fear of dropping the smartphone from the stick. Overall, the Compact Monopod Selfie Stick is an easy to use device that is functional and cool, and will help you take the best selfies. Use this device along with an iPhone camera case and lens kit for an even higher quality imag! This product is also reasonably priced, thus not heavy on the pocket. Please note - as Smart Products is a website from Romania, the prices mentioned there are in RON. 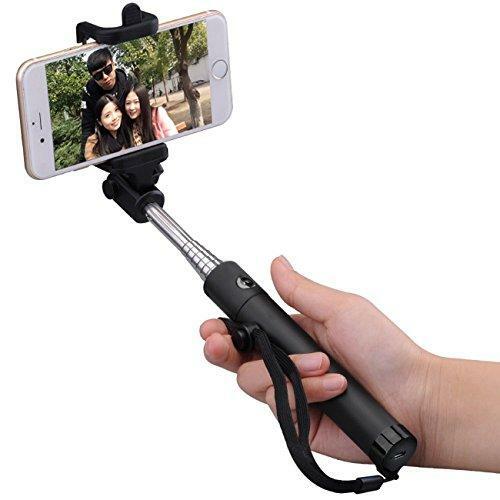 The Compact Monopod Selfie Stick is available for 89.99 RON and the price mentioned above has been converted to USD.